When three friends (thanks Connie, Ann and Judy!) 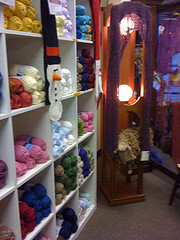 suggested that I check out Unraveled Yarns, I put it on my to visit list. I felt right at home in this little store which has a thoughtful selection of yarns and knitting supplies, as well as artful gifts. The women working there were helpful and the place just made me want to pull out some knitting needles and sit down for a visit! And, yes, I got a holiday present for my friend Susan. It’s a ….. oh wait, she might read this! Sadly they closed in April 2012. This entry was posted in Art -- there is art here!, Federal Way, Stores and other places that sell you things, Their future is in question, Unique Shopping (stores with some personality) and tagged Artful Gifts, Federal Way, friends, home, knit, knitting, presents, Unraveled Yarn, yarn on December 4, 2010 by admin.